Previously we presented a method for connecting inlets and outlets to an external source that involved tubing and needles . However, the process involves the use of needles which could be a safety concern. The process is also somewhat time-consuming. We have now developed a more convenient and rapid method for fabricating inlets/outlets in a PDMS chip without the need for needles. 1. When the PDMS device has been cured, punch inlets and outlets from the top of the device. Figure 1: (a) Schmidt Press; (b) punching through holes at desired locations on the device; (c) device with a set of three punched holes. 2. After sealing the device, insert the connectors (“Elbow Tube Fitting with classic series Barbs, 1/16”, (1.6 mm) ID Tubing, White Nylon”) into the inlets and outlet. 3.Tubing can then be connected to the connectors at one end, and to a syringe pump at the other end. The diameter of the punched holes is specific to the nominal cutting edge diameter of the punch. The punch, connectors, and tubing can be any size as long as they correspond to each other so that the connection does not leak. The connectors and tubing can be ordered from Value Plastics, INC. The height of the Schmidt press can be adjusted according to the thickness of the PDMS device to ensure a through hole. The maximum pressure we have tried with this type of connection is about 240 kPa, beyond which other parts of the chip fail (such as the PDMS/glass). Center for Advanced Biomaterials for Healthcare, Istituto Italiano di tecnologia (IIT@CRIB), Largo Barsanti e Matteucci, 53, 80125 – Napoli – Italy. 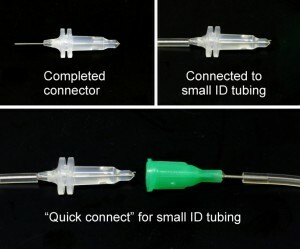 Common systems to connect microfluidics devices with classic fluidic equipment (such as syringe or peristaltic pumps) are based on the use of commercial connectors which are not always compatible with the device material. Upchurch (Oak Harbor, WA, USA) NanoPorts™ assemblies are the first commercially available products to provide consistent fluid connectors for microfluidic chips. These products bond easily to some chip surfaces such as glass and polydimethylsiloxane (PDMS) with the provided preformed adhesive rings. All NanoPort™ components are made of inert, biocompatible PEEK™ polymer (nuts and ports) and Perlast® perfluoroelastomer (ferrules and gaskets). However, many microfluidic devices are made of polymethylmethacrilate (PMMA) and in this case the preformed adhesive rings are not suitable. Here, we demonstrate an easy and effective way to bond NanoPorts to PMMA microdevices. Our approach is a hybrid system which glues the commercial nanoports with an alternative epoxy adhesive. Also remarkably this is a reusable system, in fact the Flat Bottom Port and the Flat Bottom Port Gasket may be removed and re bonded on another device as explained in the procedure. 1. Prepare the PMMA surfaces (clean with water and dry with an absorbent cloth) and NanoPort™ for bonding (Figure 1). The Inlet and Outlet holes must be of a diameter below the inner diameter of the Nanoport (around 2 mm) to guarantee no leakage at the Nanoport-PMMA interface. 2. Put a few drops of Loctite Super Attak Flex Power Gel (5g) on a surface, in our case we used a piece of PMMA (Figure 2). Take the UPCHURCH® SCIENTIFIC NanoPort, insert the gasket seal into the recess in the bottom of the port (Figure 3) and touch the port to the drop of Loctite Super Attak in order to deposit the right amount of glue on the bonding surface (Figure 4). Eliminate the excess glue with the aid of a scalpel and attach the flat bottom port gasket directly on the bottom of the port (Figure 5). 3. Take the complete Nanoport (flat bottom port and gasket) and touch the drop of Loctite super attack, eliminating the excess glue with the aid of a scalpel. Center and place the complete Nanoport on your final substrate surrounding the access hole (Figure 6). 4. Clamp the port to the substrate (Figure 7) for 3 hours. 5. Your well-bonded NanoPort interconnect to PMMA (Figure 8) is now ready to use. 6. It is possible to remove the Nanoport from the PMMA surface. Use ethanol to weaken the epoxy (Figure 9) and after 30 minutes punch with a hammer to separate the NanoPort™ from the PMMA device. Microfluidic chips are used for several different purposes in the lab. Experiments so diverse as nanoparticle synthesis; cell sorting; analytical determination of chemical and/or biological species; are all widely performed nowadays in many laboratories. Due to these so diverse applications, it is often hard to find parts (e.g. adaptors, tubing, etc) that fit the researcher’s needs for a particular project. Among these is the difficulty in finding suitable adapters to connect the microfluidic chip to tubing and syringes. A common difficulty is to connect small diameter tubing (inner diameter of 0.01 or 0.02”) to Luer adapters, which are normally designed to fit larger ID tubing sizes. A second common difficulty is the large dead volume normally associated with common Luer connectors. This can be a major setback when working with expensive and rare materials. Nanoports from Upchurch® are a valid solution for these two problems, but they are expensive, and somewhat long and bulky, which may restrict some experiments. For instance, if the connector is long, it may restrict access of a microscope lens to the area around it. Here we show a suitable way of preparing customized Luer adapters that (i) fit a wide range of microfluidic tubing; (ii) have very low dead volume requirements, and (iii) are smaller than most of the market alternatives. Natural Polypropylene Male Luer Coupler (Value Plastics, MLRLC-6). This design has the advantage of providing two custom connecters per original connecter (Figure 1). Other designs may be used, as long as one end has a Male Luer fitting. Other materials may also be used, provided that they bond with PDMS. Tygon Microbore Tubing, S-54-HL ID: .02in and ID: .04. Other sizes can be used. Polydimethylsiloxane (PDMS). We mix a 10 to 1 ration of silicone elastomer base and silicone elastomer curing agent. Cut the cylindrical ends off either side of a Luer coupler to get two connector pieces (figure 1). Push a few centimeters of tubing into the rough (cut) side of one connector and out of the clean side (figure 2). 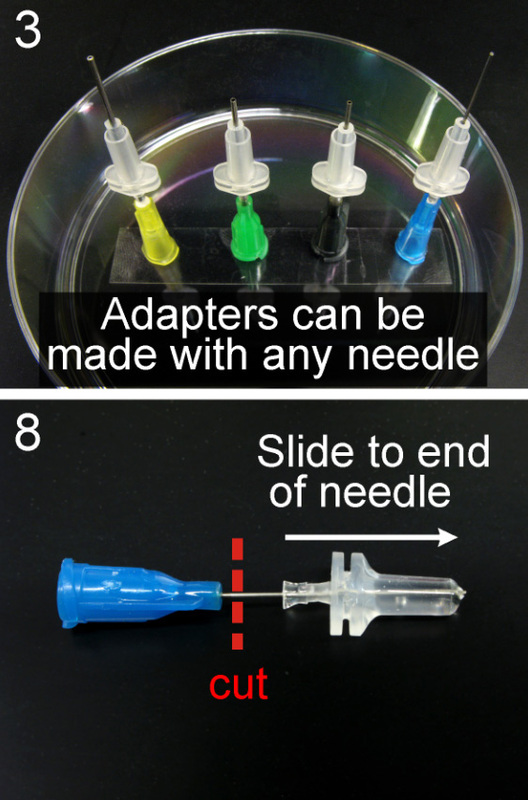 Fix the connector and tubing vertically by attaching to a petri dish with tape so that the rough end faces up (figure 3). Apply epoxy to the top of the connector so that it completely plugs the opening and fixes the tubing in place. Wait for it to dry (figure 4). One of the main purposes of the epoxy is to fix the tubing to the connector. Since it is very viscous and dries quickly, this is very suitable. Once the epoxy dries, reattach the connector to the petri dish with the opposite end facing up, and fill the rest of the connector with PDMS. Be sure not to leave any air bubbles in the connector (figure 5). Place connector and tubing on aluminum foil in an oven for two hours at 60°C. Be sure not to let the tubing touch hot surfaces in the oven. At this temperature the PDMS cures adequately and the Tygon tubing does not degrade. Once the PDMS is completely hardened, cut off the excess tubing from the clean end of the connector for a smooth face (figure 6). 1) Male Luer coupler after cutting. Both cylinders can be used to make connectors. 2) Small length of tubing pushed through connector. 3) Vertical attachment to petri dish. This makes it convenient to make many at one time. 4) Epoxy covering top of connector. 5) Epoxy on bottom, PDMS filling rest of connector. 6) Finished connector. 7) Connector attached to device. This concept is very simple and can be extended to other types of tubing (material, diameter, etc) and connectors. By fixing one tube to one connector, we avoid all compatibility problems, and minimize possible leakage problems. The tubing and Luer connector become one single unit. With this comes the slight disadvantage that each connector will be associated permanently with one tube. We don’t find this discouraging. Since both tubing and connectors are relatively cheap, we prepare a whole range of connectors at a time that fit our needs. The total amount of work required is also not more than one hour, and does not require a high level of skill. 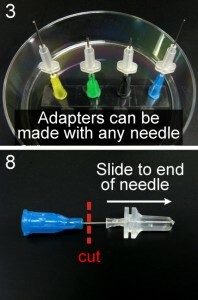 One advantage of this method, compared to other nice solutions shown here in “Chips and Tips”, is the lack of needles in the connector, which decreases the chance of leakages and needle-related injuries. We have tested the connectors with water and protein solutions of intermediate viscosity at several flow rates and leaks from the Tygon tubing-connector junction were never detected. The main purpose of the epoxy resin is to fix the tubing to the connector. Since it is very viscous and dries quickly, this is very suitable. A second advantage is that indeed, epoxy creates a rigid and robust junction between the Tygon tubing and the polypropylene material, making it very robust. The PDMS is then poured on top of the epoxy. Since the epoxy is porous, it would not be suitable to have in contact with the liquids under study. By isolating it with PDMS we fix this problem. The use of HPLC fittings and tubing in microfluidics is becoming more commonplace as the use of microfluidics in the sciences increases. Even though acrylic or PMMA is one of the most common plastic substrates used in microfluidics, the ability to strongly and easily connect an HPLC fitting to a PMMA chip has until now been elusive. Although there are some commercially available HPLC-to-chip products from Idex, they require heating the microfluidic chip well above the glass transition temperature of PMMA to create a permanent epoxy bond between attachment and chip. For these reasons, we present a simple scheme to strongly connect a standard HPLC flat bottom nut to a PMMA microfluidic device through the creation and bonding of an easy-to-make ¼-28 PMMA microfluidic union, using common lab equipment. This connection scheme has been tested with good results when using the LT-115 and P-259 ¼-28 flat bottom HPLC nut and ferrule combination for 1/16″ OD tubing (Idex). This method was tested on microfluidic devices that were not bonded with the use of adhesives. This method is adaptable to other flat bottomed nuts as long as an appropriate tap and drill bit are used. Keep in mind that as the wall thickness of the PMMA union decreases, so does the strength of the connection between the HPLC nut and the device. Using a small drill bit, drill a pilot hole for the larger drill bit to follow in the center of the circle that you cut out in Step 1. Using the larger drill bit (a #3 or 0.213″ drill bit for the ¼-28 tap), drill the center hole in the cutout piece following the pilot hole drilled in Step 2. Using the ¼-28 tap and appropriate technique, tap the hole you have been creating in Steps 1-3. Do not use oil to lubricate the plastic as it is unnecessary and difficult to clean. Thoroughly clean both the union and the microfluidic device to be bonded using a 50-50% mixture of ethanol and water. Clean only the union in an ultrasonic cleaner for 10 minutes. This mixture will not cause the union or the device to crack if they are both appropriately annealed beforehand and if the cleaning is performed within a few days of annealing. Place the union, lapped side down, onto the microfluidic device’s surface where the connection is desired. It is essential to center the union over the hole which receives the fluid or gas from the HPLC tubing. We use a small jig composed of two different sized plastic dowels to help us in this step (the black object in the bottom right corner of Fig.3). Pull some solvent into the glass syringe.While holding the union in place using your jig, gently drip some solvent from the glass syringe at the interface between the union and your microfluidic device (start with a single drop). The solvent will creep into the joint between the union you created and your microfluidic device due to capillary action. Add enough solvent to fill the gap between the union and your device, but be careful not to get any solvent into the fluid passages within your device. Being careful not to disturb the union’s position, gently apply pressure on the union until the surfaces become lightly bonded using your gloved fingers (Fig. 3). Light bond is usually achieved in less than a minute. In this step, also attempt to add enough pressure to force out any bubbles at the interface. Remove the alignment jig and add more solvent around the interface between the union and your device. This step reinforces the union’s connection to the microfluidic device. Put a small mass directly on top of the union, and leave the bonding union overnight to achieve the strongest connection between the union and your device. The authors would like to acknowledge the work of Dr. Yordan Kostov, Mike Tolosa and Mike Frizzell. PDMS (polydimethylsiloxane) is one of the most important materials in microfluidics and is widely used because of its optical transparency, ease-in-fabrication, low cost and air permeability. A widely used interconnection approach for PDMS chips is the “press-fit” method . However, the seal is only achieved by the compression of PDMS. An unexpected disturbance to the needle may damage the PDMS around it and produce small cracks leading to leakage around the needle. The mechanism of disturbance-caused leakage is shown in Fig. 1. Here, we report two easy methods of fixing needles by a secondary PDMS fabrication. In these “cure and fix” methods, uncured PDMS is poured and cured to fix needles. Sectional views in Fig. 2 show the two schematic fabrication processes respectively. Cover packaging methods can be applied to produce covers in large number used as standard components. After PDMS chips are made, simply bond them with these standard covers to seal reservoirs. We can also employ whole packaging method to fabricate one specific device with lots of reservoirs. Punch holes for reservoirs on a PDMS chip and bond the chip with silicon or glass substrates using oxygen plasma or corona treatment . Plunge unmodified needles into reservoirs laterally using the “press-fit” method. Clear away PDMS scraps with a pair of tweezers. Seal all reservoirs by bonding PDMS blocks. Cast uncured PDMS onto the chip until lower half of the needle is submerged. After curing PDMS at 70°C for 1 hour, cut the chip into proper size. Plunge an unmodified needle into the reservoir laterally using the “press-fit” method. Clear away PDMS scraps with a pair of tweezers. Put the PDMS cover on a flat culture dish and cast uncured PDMS. After curing PDMS at 70°C for 1 hour, cut the cover into proper size. Bond the cover with a PDMS chip to seal reservoirs. In order to plunge the unmodified needle into reservoirs successfully, the PDMS cannot be too thin. The thickness should be larger than 3 mm. Be careful in step 4 of whole packaging method because silicon and glass are brittle. A. M. Christensen, D. A. Chang-Yen and B. K. Gale, Characterization of interconnects used in PDMS microfluidic systems. J. Micromech. Microeng., 2005, 15, 928-934. K. Haubert, T. Drier and D. Beebe, PDMS bonding by means of a portable, low-cost corona system, Lab Chip, 2006, 6, 1548-1549. Chemical Engineering Department, Indian Institute of Technology Bombay, Powai-400 076, India. There are several ways to connect macro to micro interfaces (e.g., from syringe pump to microfluidic chip) in the miniaturization field. The ideal connector should withstand very high pressure and not leak. Commercially available Nanoports are often used as connectors but they are expensive, sometimes become clogged when glue is used, and cannot be reused. In this tip we present an easy and inexpensive way to produce a macro to micro interface connector which can withstand high pressure and is glue free. 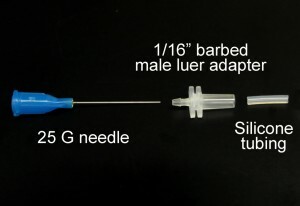 A syringe contains a male Luer part and the needle head is its counter female Luer part. There are two types of Luer fittings, one Luer-slip which when pressed together, fits in each other by friction; and the other is Luer-Lok which has threads in the male part and the female part (needle head) screws in to it (Figure 1). We used both Luer-slip and Luer-Lok syringe tips, but the Luer-Lok is better for high pressure application. Figure 1. A syringe with a male Luer-Lok connection fitting (threaded) and a needle head with female Luer-Lok fitting (purple) which screws into it. 1. Make the needles blunt with the help of grinder (Fig. 2A & B). Cut the Luer-Lok tip of the plastic syringe with a sharp blade/cutter (Fig. 2C). 2. Prepare the male Luer part. Insert the PTFE tube (OD= 1.9mm) into Luer-Lok tip (back ID= 2.3 mm and front ID is 1.75 mm) as shown in Fig. 3A. Now heat the 16G SS blunt needle and insert it into the PTFE tube up to some mm and remove it (Fig. 3B). Because of this, the tip of the tube becomes wider than Luer-Lok ID, fitting tight mechanically. Pull the Luer-Lok up to the wide tip of PTFE tube and place a drop of araldite at the back side of it (Fig. 3C). This will cause a tight fit of the Luer-Lok tip with the PTFE tube. 3. Preparation of the female Luer part. 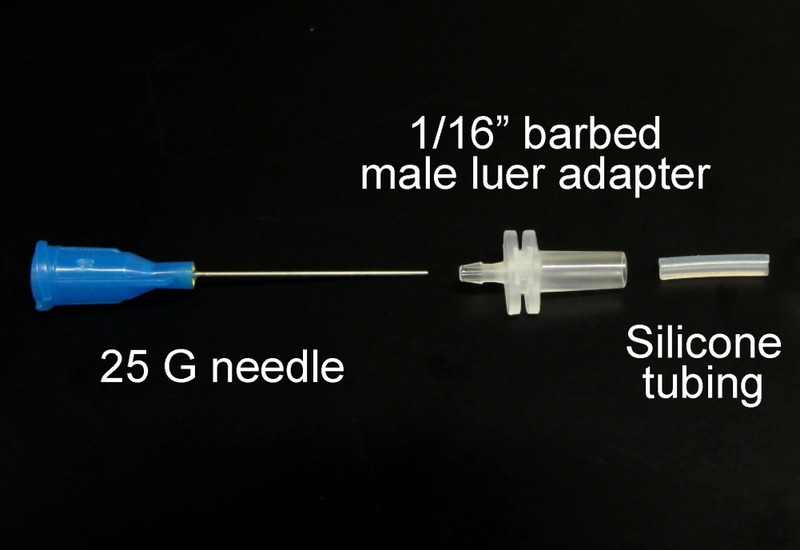 Heat the 16G SS blunt needle (OD= 1.65 mm) and insert it into 16G PTFE tube (ID=1.2mm), as shown in Fig. 4. As the needle OD is bigger than tube ID, it will permanently fit into the PTFE tube upon cooling. 4. 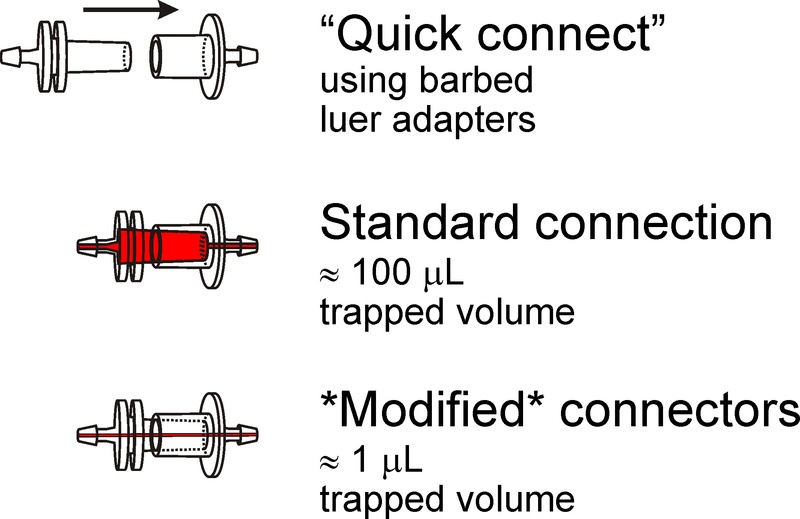 Examples of connecting the male Luer part of tubing into a needle head (female Luer part) which is acting as an inlet of micro channel assembly (Fig. 5). 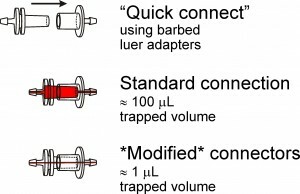 Example of the use of macro to micro interface tubing to connect a syringe to a microchip: screw fit the needle head (female Luer) into the male Luer part on the syringe placed on syringe pump and the male Luer-Lok part will screw fit into the inlet needle (counter fitting female part) of microfluidic chip (Fig. 6). We would like to acknowledge a grant provided by the Department of Science and Technology, Government of India (07-DS-032). Microfluidic systems, also referred to lab-on-a-chip or micro total analysis systems (μTAS) have been developing at a rapid pace in the last decade and offers promising analytical tools that may transform routine chemical analysis in the future. Microfluidic devices typically require multiple interconnects.1 Consequently, reliable microfluidic interconnections have become one of the basic necessities in integrated fluidic and on-chip systems. The lack of an efficient interface or interconnect between microfluidic devices and the macroscale world has historically been a major challenge and one of the greatest limiters on acceptability and the application of μTAS into the broad world market. Clearly, there is a need for a low-cost, flexible interconnects for microfluidic devices to be successful in the long term.2 There are a variety of current products available and techniques that have been used to provide interfacing between microchannels to external devices.3-6 The most common and simplest approach is the direct integration of tubing or a syringe needle into the microchip inlet using epoxy glue. The drawback is it often leads to clogging of the microchannels and these types of interconnections are impractical to remove and are not reusable. This tip presents a simple method to making reusable quick release magnetic-based fluidic connectors. It is an alternative approach that provides a simple, cost effective universal interconnects in the microfluidic applications. The magnetic-based connectors was developed using two permanent magnets that form a compression seal against the tubing line and the surface of the microfluidic device. The magnetic connector also allow for standard tubing to be interfaced with the microchips. With this approach, interconnects can be easily assembled and reconfigured numerous times without causing damage to the microfluidic device. And since connection is established though a magnetic based approach, clogging of microchannels from adhesive or epoxy can be avoided. Figure 1. Picture of system components. 1. Custom made permanent magnet shown in Figure 2. The first component was a permanent magnet that allowed for a standard tubing to be attached to a microfluidic device via a flexible compression seal. It was manufactured with the dimensions shown below to provide a tight fitting to the flexible seal when sandwiched between two magnets, which in turns compressing the tubing inside. The magnets are Neodymium magnets which are over ten times stronger than the ceramic magnets. These magnets are ideal for use as interconnects since they provide much greater holding forces. They can be purchased from Indigo Instruments or K&J Magnetics. Figure 2. Magnetic interconnect view from the top (left) and side (right). 2. Rubber cup compression seals The second component was a flexible rubber cup or compression seals. The dimension should be optimized so that the inner diameter of the seal should provide a tight fitting for a tubing (a in Figure 3b) and the outer diameter (b) is slightly larger than the magnets core so when it is sandwiched in between the two magnets, the tubing is tightly held. The last parameter is the diameter of the lip base (c), which should be larger than the magnet’s core so it can be compressed to the magnetic base and tightly secured against the microchip surface to prevent leaking. A variety selection of compression seal (vacuum cup) with different sizes can be purchased from McMaster-Carr. Figure 3. Vacuum cup used as the flexible compression seal. 3. 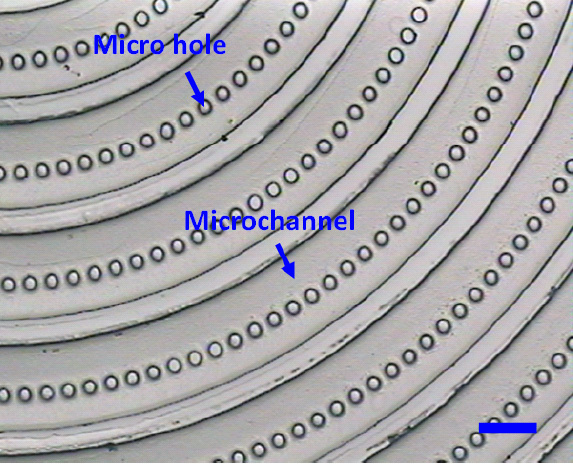 A magnetic base was used which applied pressure between the microfluidic chip and the interconnects (Figure 4). The base is particularly useful for microchip and devices having different dimensions and port locations, as the interconnects could easily be relocated. Figure 4. Side view of a microchip and magnet interconnects setup. 4. The magnetic interconnects were placed on each of the reservoir holes of the microchip to test for leaking. Figure 5. Setup used for a leak test (left) and a close up view of the magnetic interconnects on a chip (right). T. Das, D. Chakraborty and S. Chakraborty, Interfacing of microfluidic devices, Chips & Tips (Lab on a Chip), 27 February 2009. IEEE Trans. On Adv. Packaging., 2003, 26 (3), 242-247. J. Greener, W. Li, D. Voicu and E. Kumacheva, Reusable, robust NanoPort connections to PDMS chips, Chips & Tips (Lab on a Chip), 8 October 2008. J. Micromech. Microeng., 2005, 15, 928-934. Common ways to link microdevices with standard fluidic equipments (such as syringe or peristaltic pumps) are based on the use of nanoports, created by: hand screwing a tube in the substrate material, gluing the tube fitting directly on the microfluidic device or commercial nanoports. However, when such types of connection are used, there might be a series of potential issues, including: possible leakage of liquid from the connections, especially when high pressure inlet are required, possible clog of the port when glue is used or the high cost of the commercial devices. Here, we demonstrate an easy and effective way for the creation of cheap and tight microfluidic connection ports for a varied range of substrate material including glass, silicon and polymers. Our approach solves the issues reported above with the creation of and inexpensive, well tight and glue-free port based on a “wall plug inspired” effect. Fig. 1. 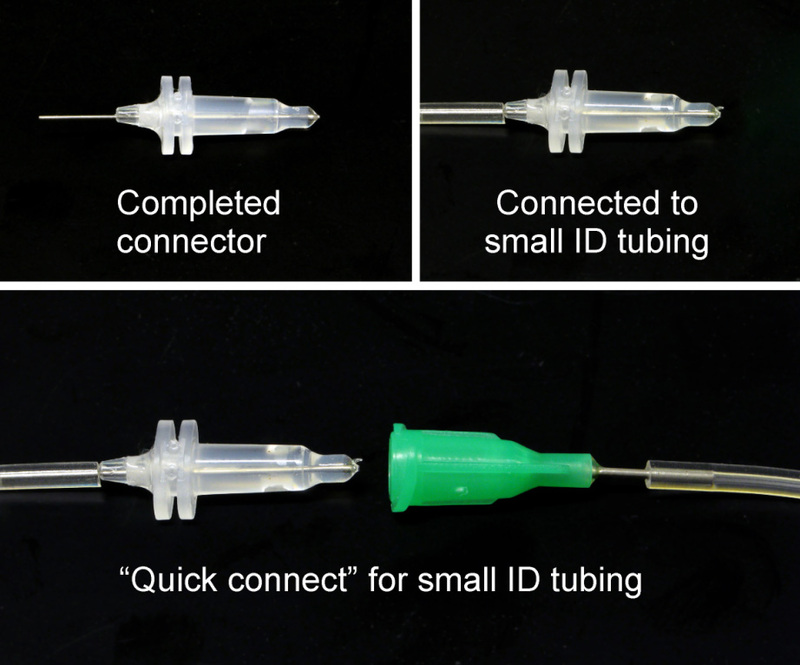 Tubing used for the production of “wall plug inspired” connectors for macro to microfluidic interfacing: FEP (fluorinated ethylene-propylene) tube (A) and hypodermic needle with Luer-Lock (21 gauge) (B). Fig. 2. Stereo photomicrographs of the FEP tube (A), the hypodermic needle (B), the hypodermic needle inserted into the FEP tube (C) and the bit used for drilling the microfluidic chips (D). Note the different (crucial) sizes as determined by photomicrograph analysis. External diameter of the FEP tube: 1.58 mm (red arrow); internal diameter of the FEP tube: 0.76 mm (magenta arrow); external diameter of the 21 gauge needle: 0.82 mm (yellow arrow); external diameter of the FEP tube after insertion of the hypodermic needle: 1.66 mm and finally, diameter of the bit used for drilling the microchips: 1.5 mm (white arrow). 1. First drill the hole on the microfluidic device you wish to connect. Fig. 3. Drilling process on different materials, namely: commercial TOPAS® COC (A) and custom made poly(methyl methacrylate) (PMMA) (B) or epoxy resin (C) chips. 2. Cut the needle and pre-insert it in the plastic tube. Fig. 4. Assembly of the”wall plug inspired” connectors. Cutting (A), sanding (B) and insertion (C) of the needle into the FEP tube. 3. Assemble the port and tighten it in the previously drilled hole by inserting the needle in the tube. The needle must be inserted deeper than the interface between tube and hole in order to leverage the wall plug effect. Fig. 6. Schematic representation of the assembling of “wall plug inspired” microfluidic ports. You are currently browsing the archives for the Connections category.